Ft.Dodge- 2-way Sleeping Sickness plus tetanus. 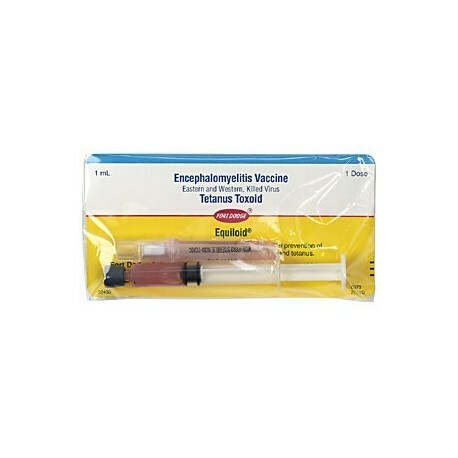 Protects against Eastern and Western equine encephalomyelitis and tetanus. Dosage: 1 ml IM and follow with a second dose 4-8 weeks later. Revaccinate annually . Fluvac Innovator 4 from Zoetis is a vaccination for healthy horses 10 months of age or older as an aid in the prevention of equine encephalomyelitis due to Eastern and Western viruses, equine influenza due to type A2 viruses, and tetanus. Single dose w/syringe and needle or a 10ds vial. 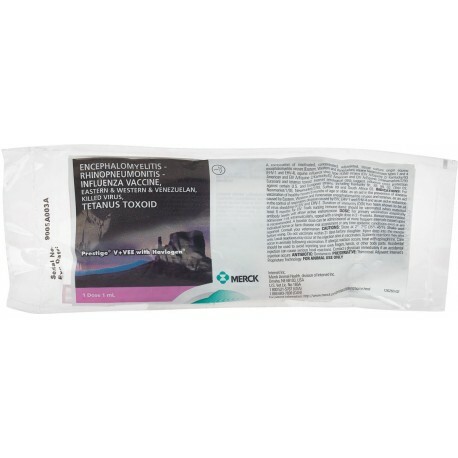 Fluvac Innovator 5 is a Zoetis vaccination for healthy horses 10 months of age or older as an aid in the prevention of equine encephalomyelitis due to Eastern and Western viruses, equine rhinopneumonitis due to type 1 and 4 viruses, equine influenza due to type A2 viruses, and tetanus. Single dose w/syringe and needle. 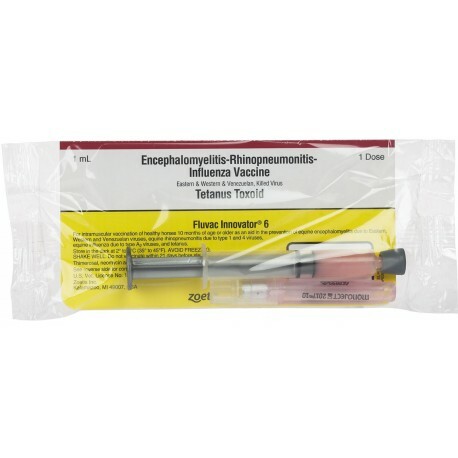 Fluvac Innovator 6 from Zoetis is for vaccination of healthy horses 10 months of age or older as an aid in the prevention of equine encephalomyelitis due to Eastern, Western and Venezuelan viruses, equine rhinopneumonitis due to type 1 and 4 viruses, and equine influenza due to type A2 viruses, and tetanus. Single dose w/syringe and needle or a 10ds vial. 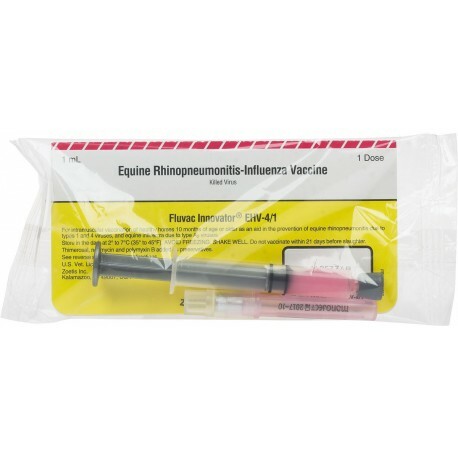 Fluvac Innovator EHV-4/1 from Zoetis is an intramuscular vaccination for healthy horses 10 months of age or older as an aid in the prevention of equine rhinopneumonitis due to types 1 and 4 viruses, and equine influenza due to type A2 viruses. Single dose comes with syringe and needle. Available in a single dose, or a 10ds. Pneumabort K +1b from Zoetis is for intramuscular vaccination of healthy horses 9 months of age or older as an aid in the prevention of respiratory diseases caused by the EHV 1p and EHV 1b viruses as well as for use in pregnant mares as an aid in the prevention of abortion due to rhinopneumonits. Single dose w/syringe and needle or a 10ds vial. 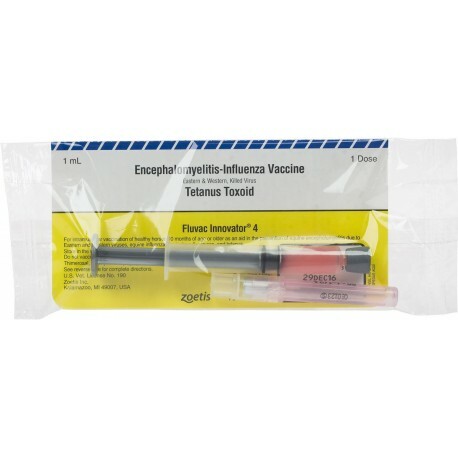 Intervet - A tetanus toxoid providing long-term protection against tetanus in cattle, sheep and horses. Initial immunization for cattle and horses is 1 cc IM, with a second 1 cc dose 4-6 wks later. A booster should be given annually. Dosage for sheep is 1/2 cc. 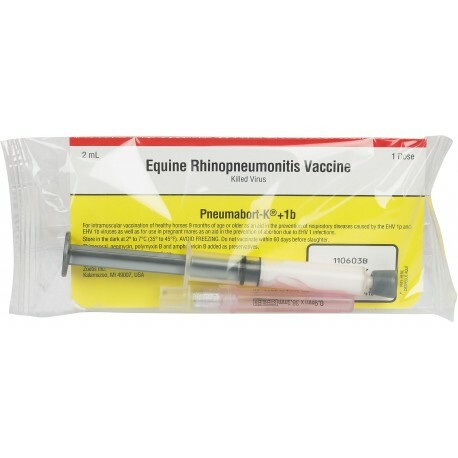 Intervet- Killed equine rhinopneumonitis vaccine to aid in the prevention of abortions, foal death, respiratory disease, or paralysis due to EHV-1. 99% reaction free. Give 2ml IM at 5th, 7th, and 9th month of gestation. 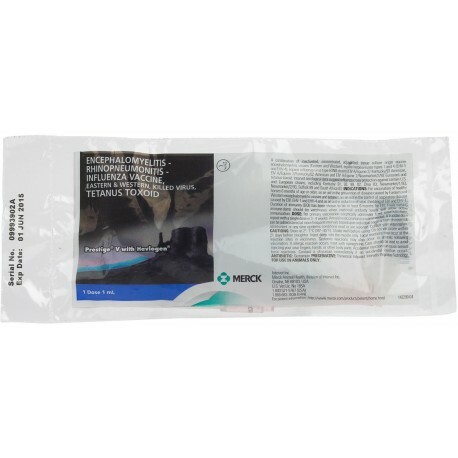 Prestige II is Merck's vaccination for healthy horses 6 months of age or older, as an aid in the control of respiratory disease caused by EIV, EHV-1 and EHV-4 and as an aid in reduction of virus shedding of EIV and EHV-1. Rhino & Flu. Single dose w/syringe and needle. 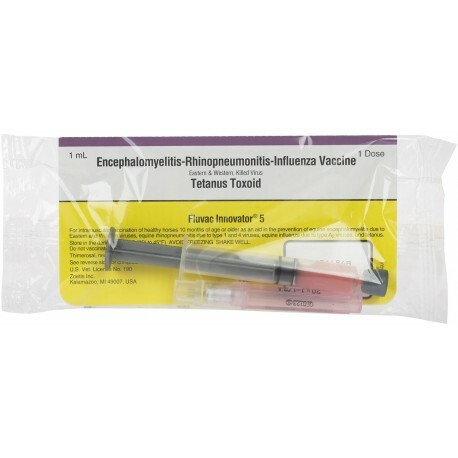 Prestige V + VEE is a 3-way Sleeping Sickness, tetanus, Flu, and Rhino vaccine for vaccination of healthy horses against Eastern, Western, and Venezuelan encephalomyelitis, equine influenza types A1,A2 & KY93, tetanus, and rhinopneumonitis EHV-1 & EHV-4. Available in a single dose w/syringe and needle or a 10ds vial. 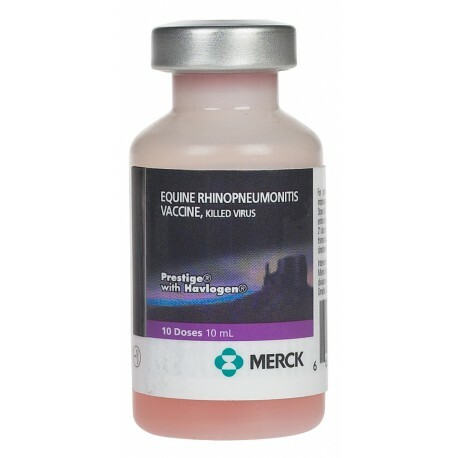 Prestige V is Merck's vaccination for healthy horses 6 months of age or older against Eastern and Western encephalomyelitis, rhinopneumonitis (EHV-1 and EHV-4), influenza (Strains A1 & A2 including KY93) and tetanus. Inject 1 ml IM, and then repeat in 3-4 weeks. Booster annually or anytime exposure is likely. Single dose w/syringe and needle.